Our driver, Stan, was funny, kind, sensitive to us in the flurry of activity on our wedding day, creative in finding some downtown locations for last minute photos, flexible, and professional. We loved our experience with this company. Transportation was not originally a part of our wedding plan, our budget, or our priority list, but this company sold us. They will negotiate with you and accommodate your desires! 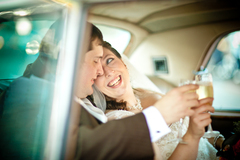 We were both very happy that we ended up hiring a car with some of the money we had saved in other areas of the wedding because it allowed us to have more captured moments as a couple on film and more quiet moments together to soak in our wedding day. Not only do I recommend this company above all of the ones that we looked at and passed over throughout the planning process, I recommend that you look into some kind of third-party transportation to allow you time alone and photos you'll cherish when the rest of the day fades to a blur. The mobility that this allowed us versus our original plan (to drive ourselves) really cannot be priced.